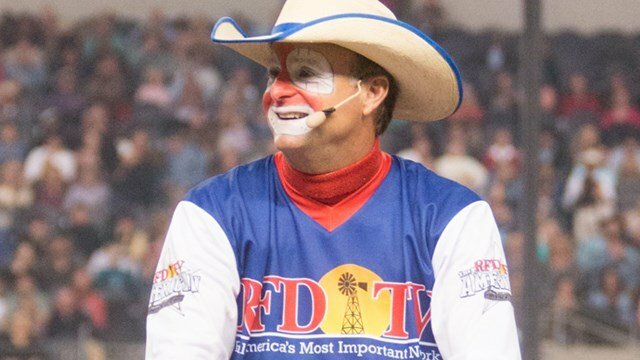 Known as the most famous barrelman in the sport of rodeo, Flint Rasmussen regularly entertains thousands of PBR fans with physical stunts, dances, and jokes during lulls in the competition. Rasmussen often works to include local and national topics into his routine. His 2016 tribute to the late artist Prince was a big hit with crowds, but references a range of topics like Michael Jackson, the Lord of the Dance, the Titanic and more on a regular basis. Born and raised in Montana he grew up around western sports. Flint gives credit to his rodeo announcer dad, Stan, for some of his skills. “My dad taught me about when the show is mine and when it’s not.” He grew up participating in sports, theatre, and music which he credits as an early training ground for his current profession. Hear more from Flint on “Outside the Barrel,” on RURAL RADIO Channel 147 on SiriusXM Fridays, at 5 p.m. ET and Sundays at 1 p.m. ET. “Best of Outside the Barrel” airs Tuesday thru Thursday at 5 p.m. ET. Get the full schedule at ruralradio147.com. Q: Favorite Rodeo Event to Watch? A: Italian, Mexican, and a good burger. A: I wish! Loved Maui a few years ago. I love sitting in the sun, with a drink, in the bleachers of a major league baseball game. A: A glass of red wine in the evening with nothing left to do but visit and think. Q: What’s your favorite thing about summer? A: Montana mornings. Going to rodeos and just being behind the scenes. Finally, for those die-hard Flint fans, you can get your very own action figure on Amazon here.